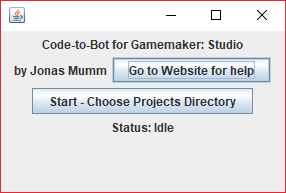 Code-to-Bot for GameMaker: Studio is a tool which extracts comments from Gamemaker Studio Projects to be used in Twitter-bots made using cheapbotsdonequick.com. Code-to-Bot for GameMaker: Studio lets you set up a Twitter-bot of your GameMaker comments within minutes! See the Step-by-Step Guide to learn how to use it! Note: Code-to-Bot for GameMaker: Studio requires Java to run. Works with both GameMaker Studio 1.x and GameMaker Studio 2.x project files.